The Patriots defense, perhaps the most-maligned #1 scoring defense in NFL history, had its issues in the first half but did what they accomplished so often in 2016. 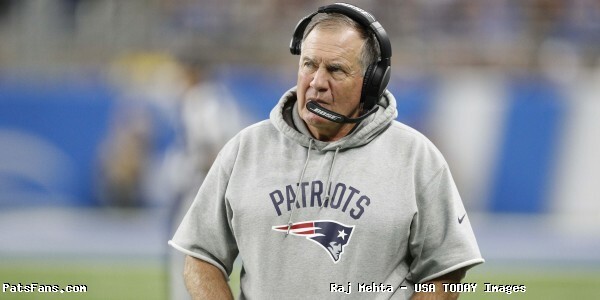 Between Matt Patricia and Bill Belichick, they made their adjustments, played good overall team defense and smart situational football and made the plays at crunch time to allow the offense to make their comeback. The result was the Patriots are gearing up for their Super Bowl parade on Tuesday morning. Since the halfway point of the season, this is a unit that kept getting better, despite the usual suspects who looked to denigrate everything the team accomplished and marginalize every victory. While the list of opposing QBs was hardly a “Murderer’s Row”, the team focused on getting things right and playing better, regardless of who was lined up opposite of them. And they did. Points Not Yards are Bottom-line: One can argue all day long about yards allowed, the Patriots will never lead the league in that category. Because their defensive philosophy is such that they’ll allow the short plays underneath because they won’t allow opponents to get the big chunk plays down the field. And they did that in the playoffs again. In three playoff games, the Patriots defense allowed a total of 54 points. With 16 against the Texans and then just 17 against the Steelers’ offense and 21 against the #1 offense in the league against Atlanta. That’s allowing just 18 points per game. And the final two games were against some high-powered offenses with Ben Roethlisberger and Matt Ryan. In the second half of their three postseason games, the defense allowed just 18 points with seven of them coming on a garbage time touchdown by the Steelers. The Falcons scored just seven points in the second half and most importantly none in the fourth quarter. First Half in Houston was hardly super, but their finish was: Atlanta’s first play from scrimmage was a huge 37-yard run by Devonta Freeman. The play was perfectly executed by the Falcons with outstanding blocking from the offensive line and especially Julio Jones that sprung Freeman on his jaunt to get Atlanta out of a deep hole. Freeman and Tevin Coleman were very effective in the first half, rushing for 86 yards, which is just 2.6 yards less than the Patriots were allowing for an entire game. But after halftime, it was a different story. Atlanta rushed for just 18 yards after the break. Freeman ended up with 75 yards rushing on 11 carries which comes out to a stellar 6.8-yards per rush. But after that big run (which coincidentally netted zero points), he carried 10 times for 38 yards. Atlanta had scored on their opening possession for the previous nine games prior to the Super Bowl. That streak ended on Sunday. So, while Kyle Shanahan is under fire for not running the ball more, especially in the fourth quarter (see Victory-Marginalization Pt1), there was a reason why he didn’t. And a lot of that had to do with the Patriots defense. In the passing game, Freeman and Coleman combined for just three catches. While two of them were big plays, a 39-yarder to Freeman where he broke a few ankles making people miss and the TD to Coleman where it was another perfectly executed play where Ninkovich was caught up in the wash inside. They weren’t the consistent targets in the passing game that we envisioned Atlanta planning on prior to the game. Ryan’s Performance Was Outstanding: Falcon’s QB Matt Ryan was the NFL’s MVP this year and his performance on Sunday night showed why that was so deserved. He completed 17-23 for 284 yards and a pair of touchdowns. But a second look at some of his big throws, especially to Julio Jones shows that the Patriots couldn’t have defended many of those any better. Several of the throws were of the very low-percentage variety that Ryan just threw dimes on. And the plays by Jones on a few of those were just ridiculous. Rather than find fault with the defense, those were some plays where one must tip their hat to the opposition. Third Down Defense Outstanding: A key area that the Patriots like to stress with the defense under Belichick is getting off the field on third down. Atlanta only converted 1 of 8 third-down opportunities. 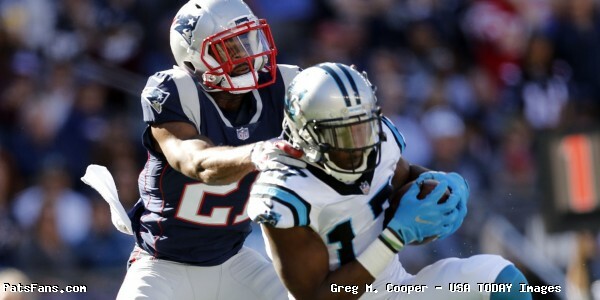 They got a second one on a close call on Malcolm Butler who was flagged for pass interference. But in the second half, the Falcons offense was 0-5 on third down. And that wasn’t against Brock Osweiler and the Texans. Atlanta was the #1 scoring offense in the NFL this season and Ryan was the MVP. Without a solid defensive effort in the 2nd half, there was no comeback in the cards. “Where are the PlayMakers?” Right Here: Another knock that we constantly hear about the Patriots defense is the lack of playmakers. In reality, it is more about the lack of name recognition than actual playmakers. When they needed big plays the defense got them. 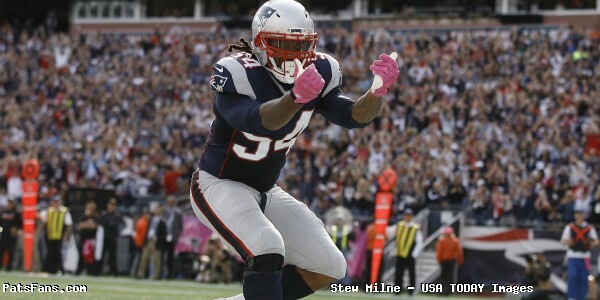 Linebacker Dont’a Hightower who is indispensable to the Pats defense came up with a huge strip sack on Ryan which flipped the game’s momentum to the Patriots. Facing a 3rd and 1, Ryan and the Falcons were going for the homerun ball, Hightower blitzed off the edge and blew past a very half-hearted block attempt of Freeman and blasted Ryan just as he was about to release the ball. 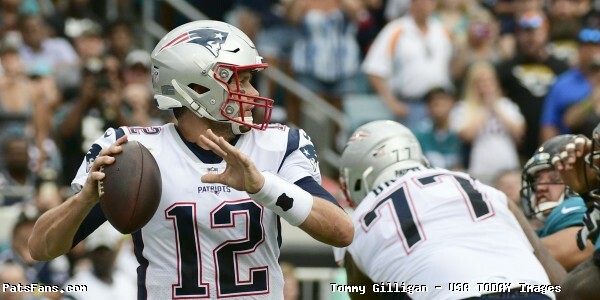 The Patriots took over at the Atlanta 25-yard line and soon scored to make it 28-20 and the Pats were right back in the game. Pay the man. 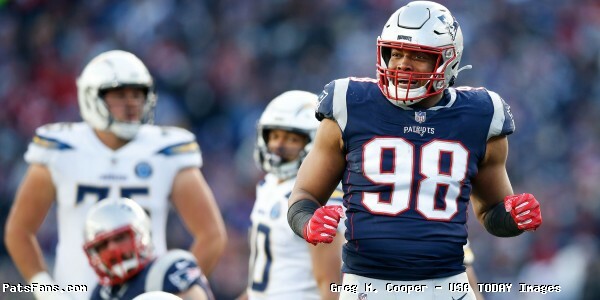 Trey Flowers continued his outstanding second half of the season with a super performance in the Super Bowl. Flowers led the team with 2.5 sacks of Matt Ryan as they piled up five sacks in just 23 pass attempts by the Falcons’ QB. None were bigger than his fourth-quarter sack of Ryan which helped push Atlanta out of field goal range. 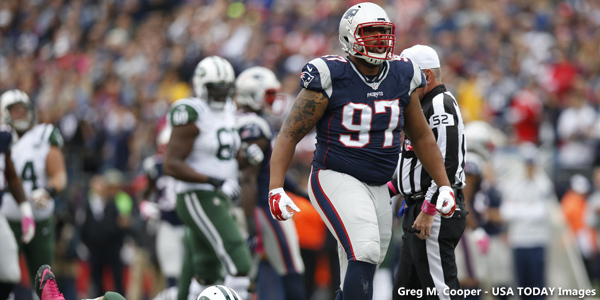 Facing a 2nd and 11 at the Patriots 23, Flowers sacked Ryan for a loss of 12 yards back to the 35-yard line. The next play was a holding penalty on Atlanta that pushed the ball back to the 45-yard line. There his third down pass was incomplete forcing a punt rather than a field goal attempt and Brady drove the ball 91 yards in 2:33 for his own “John Candy” moment to tie up the Super Bowl. The Patriots defense held Atlanta’s high scoring offense to just 21 total points with seven in the second half with none in the fourth quarter. They held them to 1-8 on third downs including 0-5 in the second half. I think Ryan and the Falcons’ offense qualify as “having faced somebody.” It was a tough game but they passed their test. 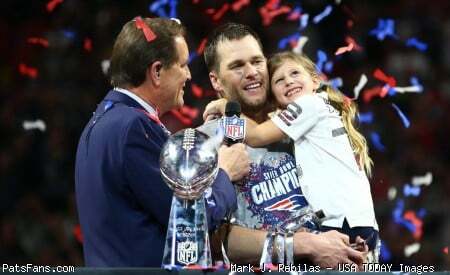 This entry was posted in NFL Commentary, Patriots Commentary and tagged 2016 NFL Season, 2016 Patriots season, 2017 Super Bowl, Atlanta Falcons, Bill Belichick, Dont'a Hightower, Jabaal Sheard, Julio Jones, Matt Patricia, Matt Ryan, New England Patriots, NFL, Patriots, Patriots edge rushers, Rob Ninkovich, Tom Brady, Trey Flowers on February 7, 2017 by Steve Balestrieri. It appears that there is little love in the Patriots locker room for Roger Goodell to the point where even one of the coaches is taking part in goofing on the NFL commissioner. 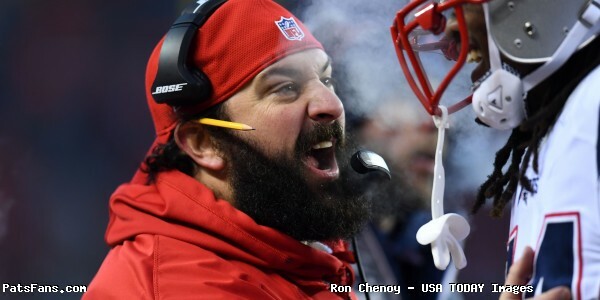 Player favorite Matt Patricia was spotted wearing a t-shirt with a rendition of Goodell with a clown nose as he got off the plane, with the Patriots’ defensive coordinator further endearing him to a fan base that watched him lead this defense to an NFL best in points allowed this season, as well as seeing that same group shut the Falcons out for the final quarter plus as the Patriots ran off 31-straight points, the final six of which came in overtime to win Super Bowl LI. 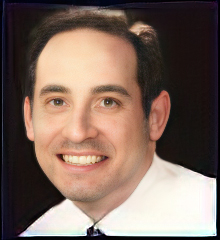 You’ve gotta love him, and fortunately after not taking a head coaching position, he’ll be back on the sidelines again for New England in 2017. This entry was posted in Patriots Commentary and tagged Matt Patricia, Roger Goodell on February 7, 2017 by Ian Logue. The Patriots are facing the #1 offense in the NFL in the Atlanta Falcons and have to stop multiple targets of Matt Ryan in order to be successful in Super Bowl LI. It isn’t just Julio Jones, who will no doubt receive the double teams that the Pats defense has under Bill Belichick saddled on most of the top WRs that they face. Stopping the running back tandem of Devonta Freeman and Tevin Coleman will be just as important if not even more so on Sunday night. Both backs are dangerous in both the running and passing game and are huge factors in the Falcons success. The Falcons’ top scoring offense excels on first down where the team averages over 6 yards per play. That sets them up for easier success in moving the chains and looking for big plays when they’re already in great position in terms of down and distance. How do they do it? They disguise their intent as well as anyone, showing run in a tight formation or pass in a spread and use their speed to find holes in the defense. The two have combined for 2482 yards and 24 touchdowns from scrimmage in 2016 in the running and passing games. They can run between the tackles or break it to the outside and find big yardage if the edge isn’t set. Both are excellent pass receivers out of the backfield and frequently line up as receivers split wide, much like the Patriots do with James White and Dion Lewis. Both are very fast but Freeman is the shiftier of the two and can make more people miss. Coleman isn’t as elusive but has more speed and once he sees an opening can blast into a gap and be gone. The Falcons will have probably studied the film the last time the Patriots lost, back in November against the Seahawks. Seattle used RB C.J. Prosise expertly, in both the running game and out of the backfield and he was a major factor in the Seahawks success. They may also take the approach they used in their big win in Denver where both Coleman and Freeman were nearly unstoppable out of the backfield against Denver’s defense. How do the Patriots defend against the two? 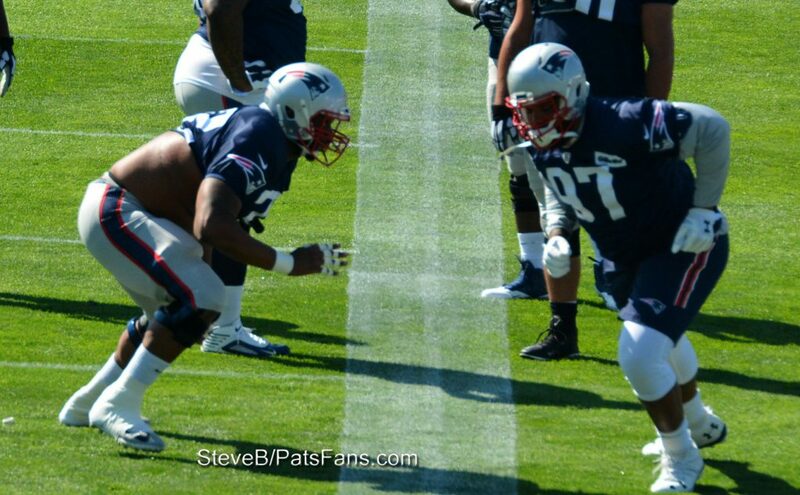 It starts with Alan Branch and Malcom Brown inside. The two big men will have slow things up as they’ve done so effectively all season. If they hold the line at the point of attack, that allows the linebackers Dont’a Hightower and Elandon Roberts to fly up and make plays before the backs get to the second level. But the players on the edge, Trey Flowers, Chris Long and Jabaal Sheard, must do a great job of setting the edge and not allowing the backs to hit the edge with speed. One thing in the Patriots favor is their tackling ability. The Pats have been one of the surer tackling teams in the NFL this season. In the passing game, Belichick and Matt Patricia may put linebacker Kyle Van Noy or Shea McClellin in coverage against one of the tandem and may press safety Pat Chung into a coverage role down low. It is going to be an interesting chess match to see how they try to matchup. But first and most importantly they have to stop or at least slow down the running game. In the four games where Atlanta failed to rush for more than 80 yards, they lost three of them. The Patriots were 8-0 when holding an opponent to 80 yards rushing or less. Nobody has done it to Atlanta lately and they’ve had their way with every defense they’ve faced. The Patriots may dust off their Super Bowl XXXVI defensive game plan against Marshall Faulk and the Rams “Greatest Show on Turf”. They were very physical and hit the RB every time he came to the line. 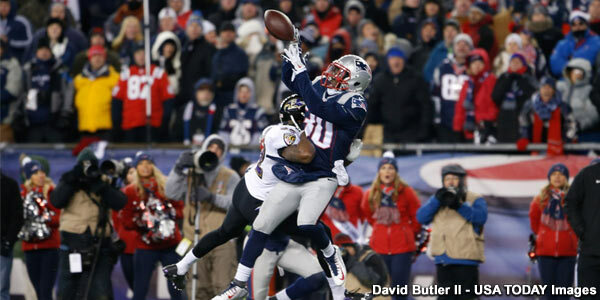 It threw off the rhythm and allowed the Patriots to hold that high-powered offense in check. Hit them, be physical and slow their timing down while putting the offense in much less favorable conditions to make first downs is a key recipe for success. It will be a tall order against the most prolific offense in the NFL this season. We’ll break down all of the key matchups later this week but this will definitely be one of them to watch. 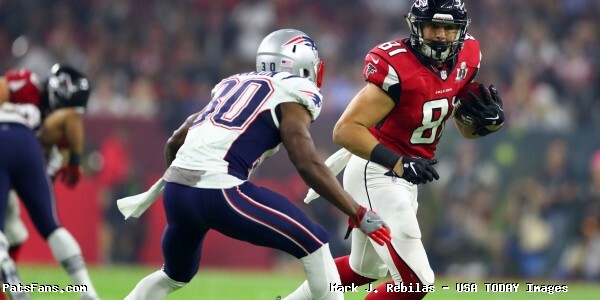 This entry was posted in NFL Commentary, Patriots Commentary and tagged 2016 NFL Season, 2016 Patriots season, Atlanta Falcons, Bill Belichick, Devonta Freeman, Dont'a Hightower, Falcons running backs, Julio Jones, Matt Patricia, Matt Ryan, NFL, Patriots, Patriots edge rushers, Rob Ninkovich, Super Bowl LI, Tevin Coleman, Tom Brady, Trey Flowers on February 1, 2017 by Steve Balestrieri.